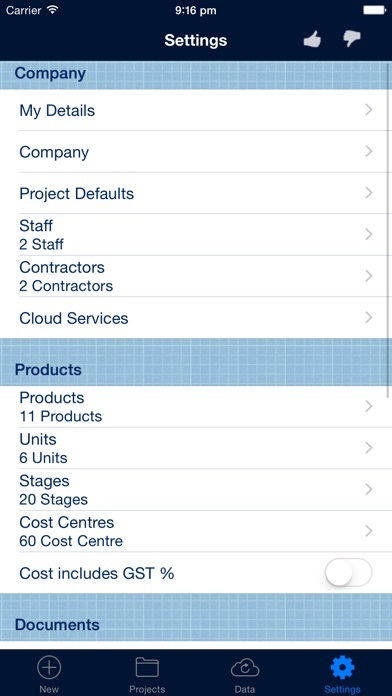 If you're in the Construction game, you need this App. Turn your iSO device into a working tool you can't live without. Free to download, BUT you will need to purchase the Full Upgrade or individually the sections you want to allow you to preview or email off PDF documents. Got a question, heres our phone number +61467580011. To purchase part or all of the app, preview a document and it will ask you to upgrade. It has been done this way to allow you to play with the app before your purchase it. If you think you can use this app, buy it, if not, keep searching! See why tens of thousands have downloaded this app. We must be doing something right?? All of the above are emailed of in PDF format. 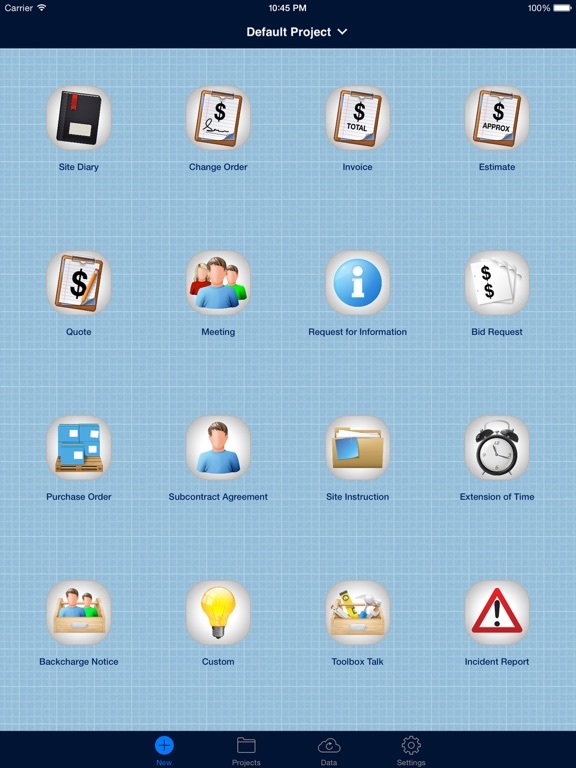 This App has 16 different documents that you can create out in the field and email directly to your client and or office. Set up a project on your device & email off to your team so they have the same project information, start & stop times & scope of works. Import your products/materials via CSV. See website for further information. Export times sheets for payroll. 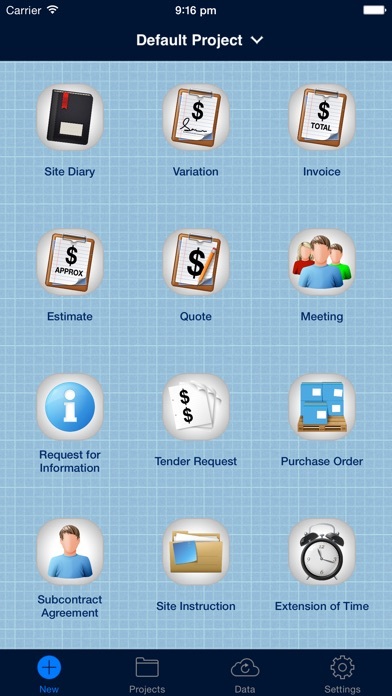 Send Estimate, Quote, Invoice, Change Order, Meeting, RFI, Backcharge Notice, Toolbox Talk and Incident Report to your other iSO device or devices. 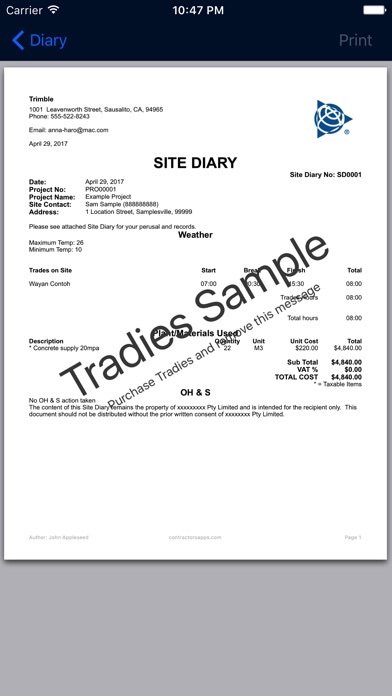 This is a Mobile office tool for management for construction and trades providing quick and easy documents we need every day. Settings: Enter the users details, company details, logo, Taxes, Licence details, set up your products/plant, custom notes, staff, contractors, opening and closing messages and your signature. This app is not about being an accounting system, it is about getting the information off site and back to the office or in the hands of your client!